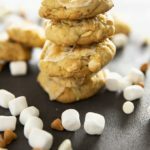 Salty Marshmallow Cookies are my take on classic potato chip cookies! 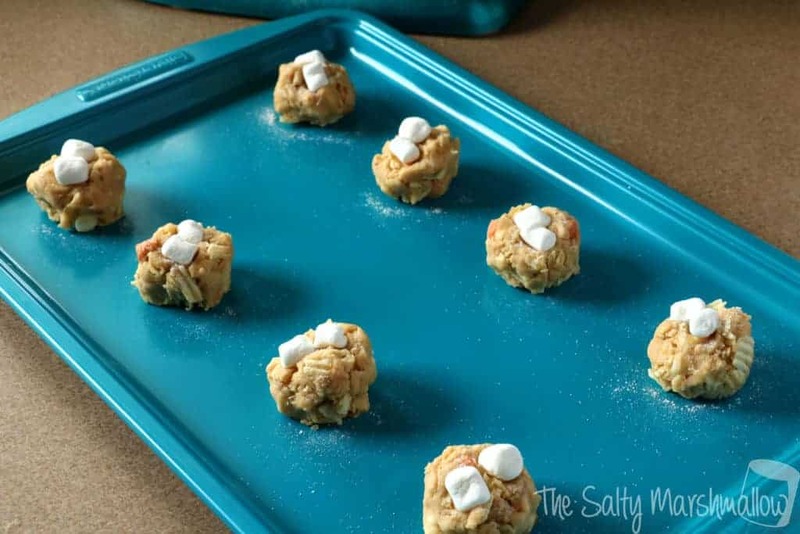 You will fall in love with these sweet and salty cookies that are full of potato chips, butterscotch chips, white chocolate, and marshmallows! 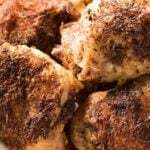 This recipe was originally posted on April 18, 2016. 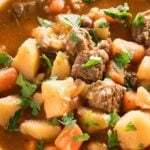 One of the very FIRST recipes I ever put up on my blog! I am updating it today with more organized instructions. I am adding a few new vertical photos as well, but, I am leaving the older photos becase they are great process shots of how these cookies are made. Plus, they are very dear to my heart! Classic potato chip cookies are a simple mixture of basic cookie dough with crushed potato chips. Over the years, I have seen many versions! “Salty Marshmallow Cookies” are my take on the classic potato chip cookie. Mine are over the top with salty/sweet flavor. 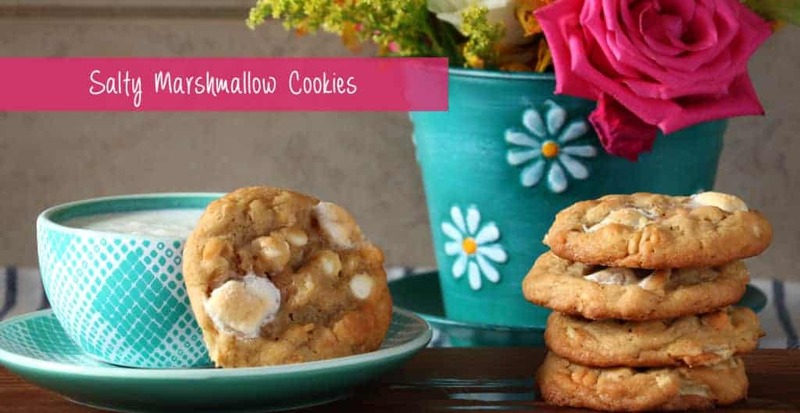 Packed full of ridged potato chips, butterscotch and white chocolate chips, and marshmallows. They are completely irresistible! 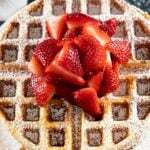 To start, go ahead and cream your softened butter and sugars together with both the vanilla and almond extract. 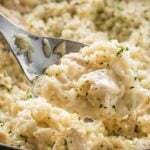 Once this mixture is light and fluffy, you can beat in both of your eggs. 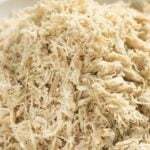 Then, in a separate large bowl whisk together all of your dry ingredients. Add the dry ingredients to the butter and egg mixture and mix on low speed until well combined. As you can see, this dough is fairly thick. 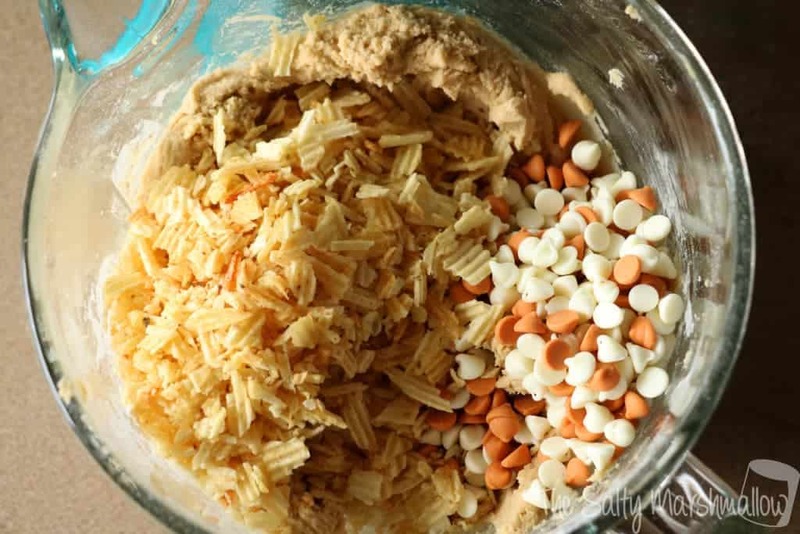 Add your crushed potato chips, butterscotch, and white chocolate chips and mix by hand (if you feel strong enough) or, mix just until combined with your mixer as I do! At this point, the dough needs to be chilled for 30 minutes before baking. Don’t skip this part. It keeps the cookies from becoming too flat as they bake. Once the dough has chilled, you can place the cookies on a cookie sheet prepared with non-stick spray or parchment paper. Then, slightly press two marshmallows onto the top of each ball of dough. Cool the cookies on a wire rack, then store in an airtight container. Note that these are best eaten within 5 days of baking. Cream together butter, both sugars, vanilla and almond extracts. 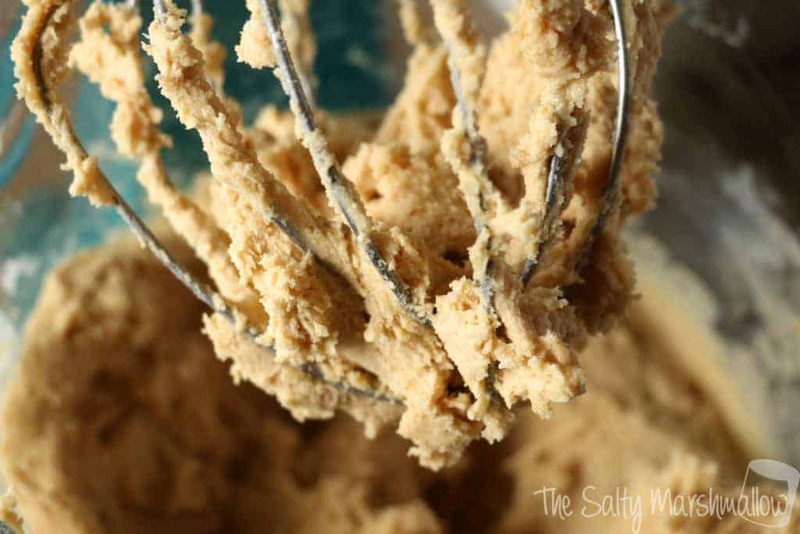 In a separate bowl, mix together the flour, baking soda and salt with a whisk. 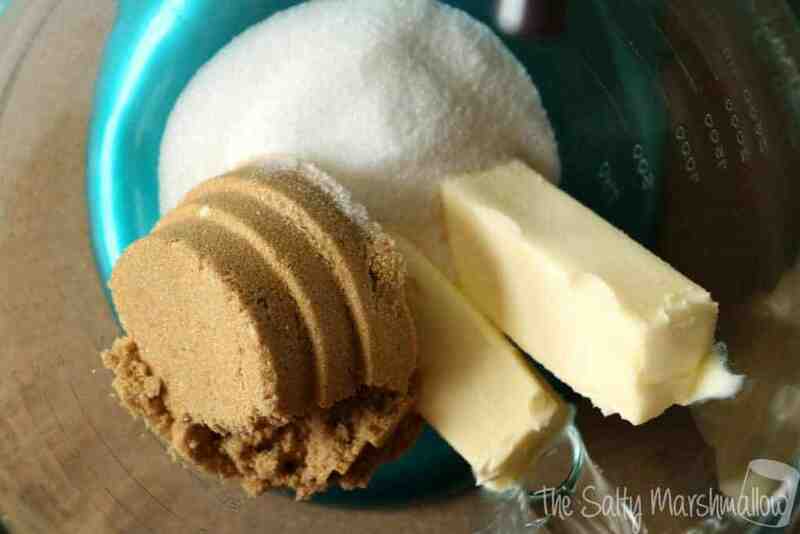 Add dry ingredients to wet and mix. Fold in the butterscotch chips, white chocolate chips, and potato chips. Preheat oven to 350. 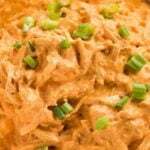 Place dough on greased baking sheets in heaping tablespoon fulls. 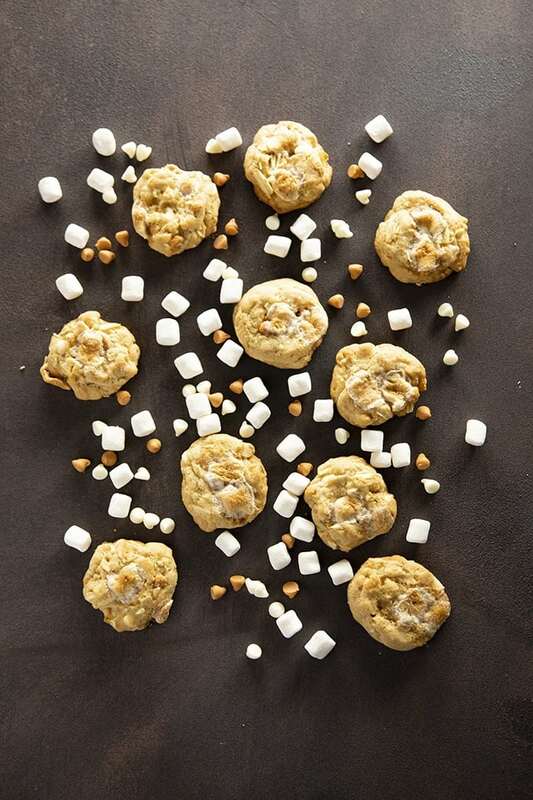 Slightly press two marshmallows into the top of each cookie, and sprinkle cookie with sea salt. Bake for 11-12 minutes for soft cookies. Cool on pan for 5 minutes, move to wire rack to finish cooling. Thank you for this recipe.One of my favorite so far. Love the salty,sweet flavor. 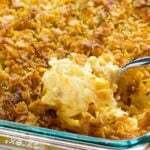 What brand of potatoe chips did you use in this recipe. Jackie, I typically use Ruffles or Wavy Lays. Also, where did you get that beautiful baking sheet?! So cool! 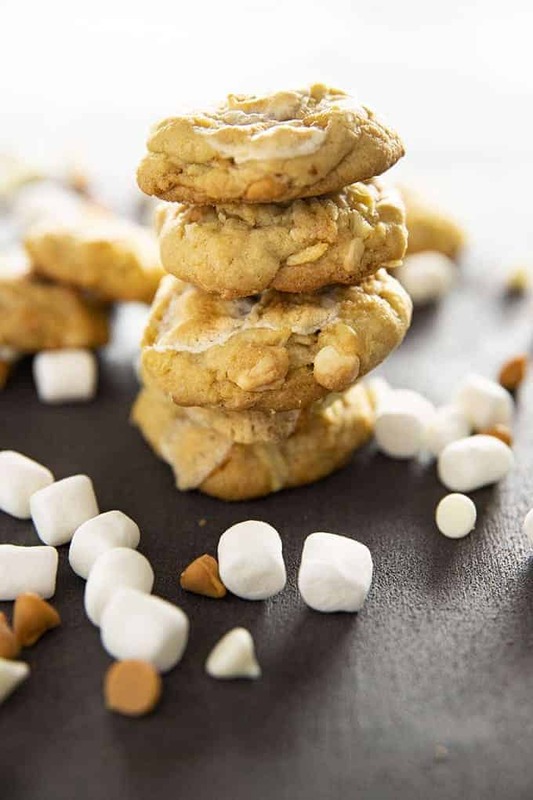 We all know salted caramel but salted marshmallow cookies… Sounds good to me 🙂 And great picture, I saw it on foodgawker and had to come check the recipe! Hi Vivian! Thank you for the compliment on my picture. Salty Marshmallow cookies are definitely unique! I hope you get the chance to try them out!